Charles LeBlanc is a Canadian blogger. He has become known regionally for covering events around the province of New Brunswick. LeBlanc was arrested twice. On June 9, 2006 we was shortly detained while covering a conference in Saint John when police cracked down on protesters. He spent four hours in jail, and says police deleted all the photos from his digital camera. In November 2006 he was finally acquitted on an obstruction charge. Also in Juni 2006, LeBlanc was barred from entering legislature grounds in New Brunswick's capital Fredericton. 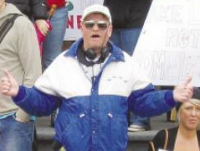 On April 23, 2009 the blogger was again shortly arrested after allegedly entering legislature grounds in Fredericton when according to his own statements covering a protest.